At the end of the 19th century several projects were submitted to enhance and redesign the gardens in Castello, Venice, a large green area scarcely enjoyed by the inhabitants due to its suburban position, far from the centres of urban life. These projects included the idea, which later became reality, to build a Greenhouse (tepidarium) made of “glass and iron,” a representational architecture capable to host the palm trees and other decorative plants in use at the coeval International Art Exhibition. The initial project, devised in 1893 by Trevisanato, Head Engineer of the Technical Department of Venice Municipality, presented two possibilities: a masonry greenhouse of austere appearance and its variation in “iron and glass” of elegant and fine aesthetic. The Greenhouse was built in 1894 in the metallic carpentry, a political choice aimed at creating a job opportunity for the unemployed workers of the local metallurgical companies, an industrial sector then suffering a severe economic crisis. The new building was placed at the end of Viale Garibaldi, where then used to stand the three convents of San Domenico (1312), Sant’ Antonio (1346) and Sant'Anna (1242) strictly connected by the popular housing fabric. Napoleon's coming to power involved profound urban transformations and, with the suppression of the monastic orders in 1809, the demolition of the centuries-old cloister areas was decreed. Wishing to fashion Venice according to the model of the most important European capitals, it was decided to transform the area in public gardens, with the partial execution in 1810 of the project by Giannantonio Selva. The nineteenth century building set an example of outstanding architecture: it was placed in the public gardens, at the end of the long tree-lined avenue, thus isolated from the adjacent urban fabric, made for the most part of a dense residential housing. The choice of an iron sheeting underlined a desire that the architecture of the Greenhouse would stand out, as only the most prominent buildings of Venice are characterized by similar roof covering (e.g. the Rialto Bridge or the dome of San Marco and several other churches). In a rare photograph of 1927 the Greenhouse appears with open window and door frames, partly screened by external curtains (see, in the gallery, the black and white picture of Serra dei Giardini in 1929 from Fondo Giacomelli): it gives evidence of the original appearance of the Greenhouse, whose surfaces were painted white like most of the contemporary greenhouses in Europe. Further to its construction, the Greenhouse underwent several transformations that modified the building and its surroundings in a more or less inappropriate way. The colour of the Greenhouse was changed, the roof plates were replaced with other materials and, soon after the Second World War, some solar flower chests made of concrete were built in the ground as well as some service structures, in order to increase the productivity of floriculture. The crumbling main bodies of the building made of reinforced concrete and leaning against the Greenhouse were partly demolished in the first half of the 1990s, clearing the Greenhouse surroundings of architecture masses of no historical value. 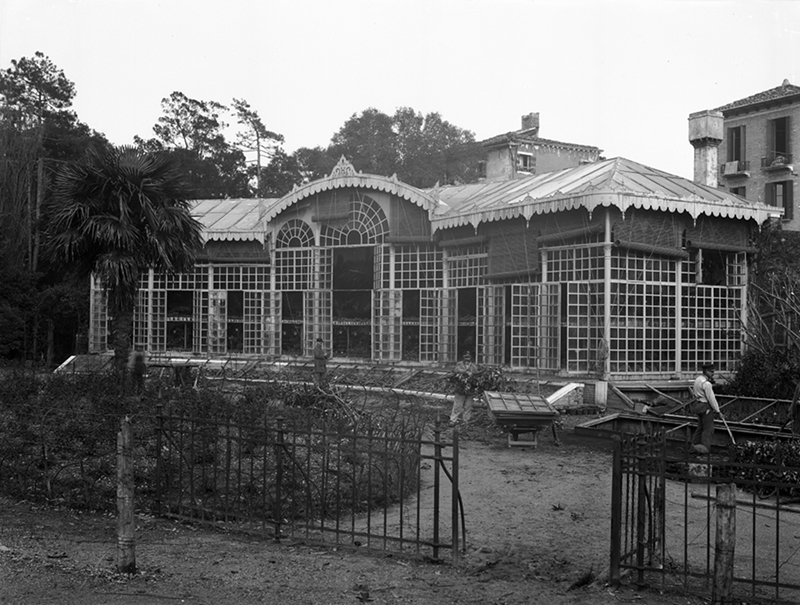 The building underwent more changes in the following years: the covering surface was replaced with Marseillais tiles, more solar flower chests in cement and greenhouses, partly below ground level, were added, although untidily scattered in the green area in front of the Greenhouse; the Greenhouse was enlarged with a smaller and lower body in glass and iron to be used as service area, connected to the original edifice by two flights of stairs, and a new central heating boiler with circular finned cast-iron radiators was installed in 1929. In the early 1990s the Greenhouse, by then a deposit and area for the activity of the municipality gardeners, was definitively abandoned, and slowly but inexorably declined. Only in the spring 2006 some protections were built and safety measures were taken to reinforce the roof cover. We would like to thank Marco Ercole, architect and author of the essay “Architetture di vetro e metallo del XIX secolo, cenni storico-tecnologici sulle costruzioni simbolo della Modernità. Un esempio veneziano, la serra municipale dei giardini di Castello: conoscenza e restauro” [Nineteenth century glass and iron architectures, historical and technological notes on buildings as symbols of Modernity. History and restoration of a Venetian example: the Municipality Greenhouse at the gardens in Castello] published in the March 2008 issue of Rivista della Stazione Sperimentale del Vetro, for his kind permission to reproduce the content of his article.